So we rented Marie Antoinette last night and I am struggling to find a single positive thing to say about this movie. The film is visually stunning and was shot on location in Versailles, but beyond that it was one of those films where my mind screams afterwards "I want those two hours of my life back!!!!!" I found the storyline to be flat, nor anything redeeming about the lead character (and I believe that was the vision of writer/director Sofia Coppola). I am not certain about the historical accuracy, but the cheesy 80's soundtrack did nothing to set the atmosphere or the mood. Right down to the pink font ala' Sid & Nancy used to introduce the film's title, I felt like I was being set up to watch a B movie not a sweeping historical epic as was promised. 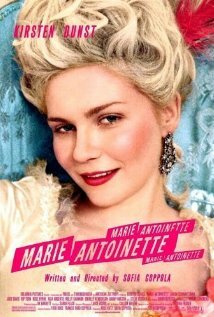 Marie Antoinette has received an Oscar nomination along with another 6 award wins & 9 nominations. Apparently someone liked this wretched film. Don't read any farther if you do not want a big spoiler! Too be honest, and quite frank by the end of the two hours I felt quite ripped off that this dreadful movie did not end with the execution by beheading of the two lead characters, which at that point I was greatly wishing for! Anyone else feel the same about this movie? Or am I alone on this? I haven't seen it, but I'll probably rent it. I read enough about it to know that the characters are shallow, and intended to be that way by Coppola. Sometimes the mix of periods works and sometimes it doesn't, but I'm willing to give it a shot. A lot of people have said they liked it. Thank you for your post. I thought it would be a bad, but not that bad.I like my historical dramas to have some history to them not be just a teenage costume party, like the trailer. If you want to see a good movie on Marie Antoinette, see the 1938 version starring Norma Shearer. Thank you for your recommendation regarding Norma Shearer's film version. That I will definitely look into. Cheers! i was thinkin about seein this movie, i heard alot of good things about it, but it dont seem like my kinda movie, so i dunno if i'll see it or not yet! I heard a lot of really good things about this movie as well, and initially wanted to see it in the theatres. I love historical movies, but too be honest I found it very disappointing and I'm glad we waited to rent it. It might be some people's cup of tea so to speak, but it was definitely not to my liking. Thanks for your reply!